In the spring, summer and fall -- and sometimes winter -- a three-season room stays warm even without insulation or a heating system, courtesy of the greenhouse-like effect produced by its many windows. What the bright space needs, however, is the right flooring. The floor that you choose depends largely on such factors as climate, durability and your style concept. Create a visually pleasing transition from the outdoors in by carrying the same hard-surface flooring from an adjoining outdoor patio to your three-season room. The room might only have its walls supported by in-ground piers or footings with no foundation. In areas where winter ground heaving isn't an issue, the interior "floor" simply can be a level sand base on which to support brick pavers or concrete blocks. Alternatively, you can cover a concrete slab base with brick or block flooring, as long as doorway thresholds are high enough to clear them. Today's indoor-outdoor carpeting is ideal for three-season rooms, and it comes in more options than the fake grass of yesteryear -- and even that doesn't look as cheesy as it used to. Carpet with quality ultra-violet ray protection lasts longer than untreated carpeting when it's exposed to unleashed sunlight. Indoor-outdoor carpeting is available in richly colored solids, mottled neutrals, and even interesting and playful patterns, such as multi-colored floral prints, that transport you to a "garden" without your having to step outside and mingle with insects. Low-pile carpets are easier to keep clean than high-pile varieties -- especially important if the room has outdoor access. Installing reclaimed-lumber flooring in a three-season room is more than ideal. Gracefully aged, pre-faded wood won't end up badly sun-beaten and patchy under furniture. Using reclaimed-wood flooring labels you an unofficial "recycling star," and it provides visual warmth and rusticity that suits the outdoorsy vibe of a space where the many outdoor views are its "art." Natural or engineered stone or tile flooring is fitting in a window-wrapped space. 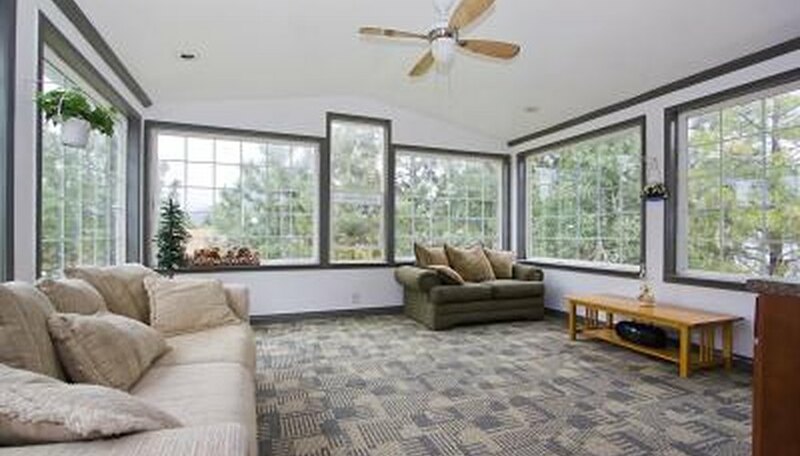 Solar heat warms stone, tile and concrete flooring, which retain heat, unlike carpet and wood. You'll appreciate a little heat underfoot whether you're enjoying a morning coffee or entertaining on a summer's eve. Slate, granite, travertine, or earthy stamped or stained concrete, for example, plays into an outside-in setting without the unpredictable wind, rain and cool temperatures that go with lounging alfresco. No matter what type of flooring is under it, a rug helps to protect it, but not all rugs are equal. A sisal or seagrass rug is a mediocre choice for sunny but dry areas; unless you rotate them every month or so, they'll fade unevenly. Some quality rugs, such as well-made wool rugs with durable dyes, withstand fading better than others. Installing easy-to-open window treatments -- remote-control-operated blinds or roller shades, for instance -- that you can close when you're not using the sun-filled room, is an optimal way to protect whatever flooring you choose. Isberian Rug Company: Sun Fading: What Is UV Protection and Why Is It a Scam? What Kind of Insulation Should Be Put Under a Concrete Slab in a Garage? Can I Use Concrete Bricks in a Fireplace?